“On June 15, 2012, the Secretary of Homeland Security announced that certain people who came to the United States as children and meet several guidelines may request consideration of deferred action for a period of two years, subject to renewal. They are also eligible for work authorization. Deferred action is a use of prosecutorial discretion to defer removal action against an individual for a certain period of time. Deferred action does not provide lawful status.” – USCIS government website. These individuals are undocumented immigrants who were brought to the United States as children, a group often described as DREAMers. 1. Through March, 1,586,657 people nationally have been approved for the program, and of those, 799,077 have been approved for renewals, according to U.S. Citizenship and Immigration Services. Nearly 800,000 people are protected under the DACA program. 2. The recipient must have come to the United States before reaching their 16th birthday. 3. DACA recipients have been able to come out of the shadows and obtain valid driver’s licenses, enroll in college and legally secure jobs. 4. The program doesn’t give them a path to become US citizens or even legal permanent residents — something immigrant rights advocates have criticized. 5. 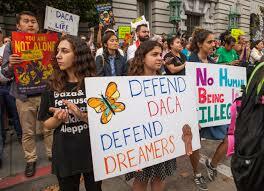 Under DACA, Dreamers were able to apply to defer deportation and legally reside in the US for two years. After that, they could apply for renewal. 6. DACA does not prevent recipients from being deported if they are convicted of a crime. 7. Eliminating the program would deal a major blow to the U.S. economy, according to a new report by the Center for American Progress. It would also cost employers $3.4 billion in turnover costs to replace lost workers and reduce contributions to Medicare and Social Security by $24.6 billion over 10 years. 8. DACA beneficiaries cannot receive federal benefits such as welfare and food stamps. 9. If Congress does not pass a measure protecting DACA recipients, nearly 300,000 people could begin to lose their status in 2018, and more than 320,000 would lose their status from January to August 2019. The US is no longer accepting initial requests for DACA, but they will adjudicate initial requests for DACA accepted by Sept. 5, 2017. The US will no longer approve advance parole requests associated with DACA. The US is only adjudicating DACA renewal requests received by Oct. 5, 2017, from current beneficiaries whose benefits will expire between Sept. 5, 2017 and March 5, 2018.